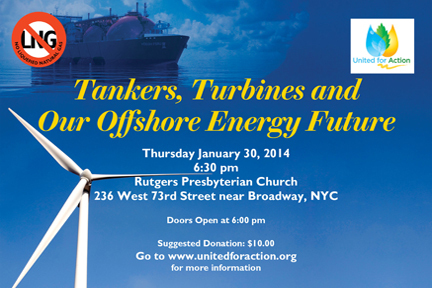 Join us at the beautiful Rutgers Presbyterian Church on West 73rd Street on Thursday, January 30th to learn the latest information regarding two potential offshore energy scenarios. Sean Dixon, an attorney with Clean Ocean Action, is one of the leaders of a coalition against Liberty Natural Gas, which wants to build a liquefied natural gas port off the NY/NJ harbor in the shipping lanes. Learn what you can do to help stop this dangerous and polluting project that will pave the way for increased gas fracking. Then hear from David Alicea about the benefits and drawbacks of offshore wind, and what would be necessary to realize a project off our shores. Al Appleton will discuss “enlightened” energy policy which our state should lead the way in promoting, and what we can all do to help. Starts at 6:30 pm, doors open at 6:00 pm. Co-sponsoring organizations: 350NYC, Brooklyn Food Coalition, Carbon Squeeze, Catskill Citizens for Safe Energy, Clean Ocean Action, Coalition Against the Rockaway Pipeline (CARP), Food & Water Watch, Frack Action, Greater NYC for Change, Hell’s Kitchen for Action, NYC Coalition of Block and Community Leaders, NYC Friends of Clearwater, Occupy The Pipeline, Sane Energy Project, Sierra Club, Three Parks Independent Democrats, West 75th Street Block Association, West 80s Neighborhood Association, Westchester for Change, and others.